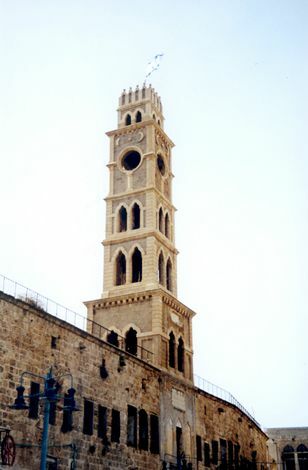 Six or seven miles north of Haifa, Akko or Acre is an ancient city. 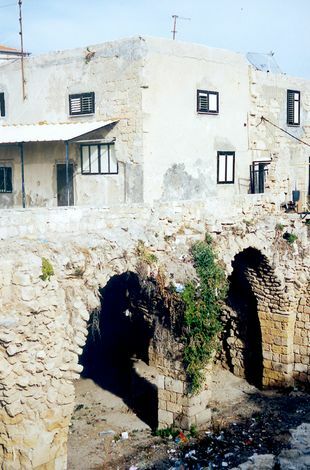 Displaced by Caesarea, it was restored to prominence when that city's harbor silted in the 7th century. 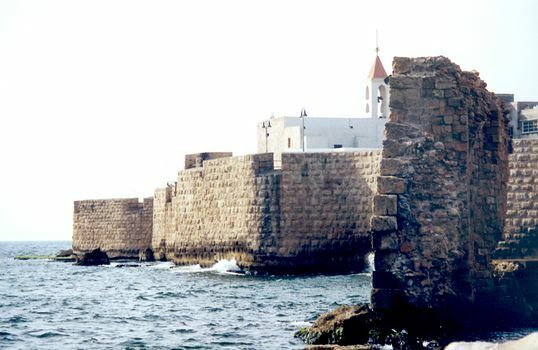 Akko fell to the Crusaders in 1104, was taken by Saladin in 1187, seized by Richard the Lion-Heart three years later, and lost to the Mamluks in 1250. For the next 500 years it was abandoned until Ottoman weakness in Napoleon's time prompted an Albanian named Ahmed Pasha to take over. His common name was el-Jazzar, "the butcher." 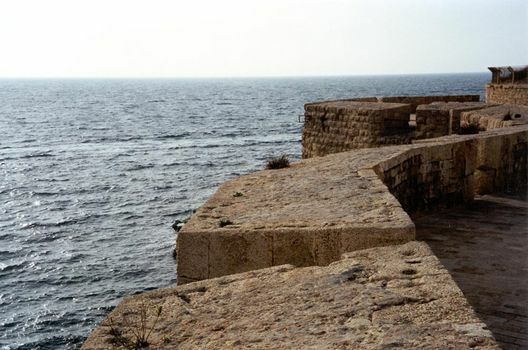 The sea wall, re-faced by el-Jazzar after the Napoleon's unsuccessful siege of 1799. A more distant view of the wall, with St. John's Church (1737) perched on the vaulting of a Crusader church. 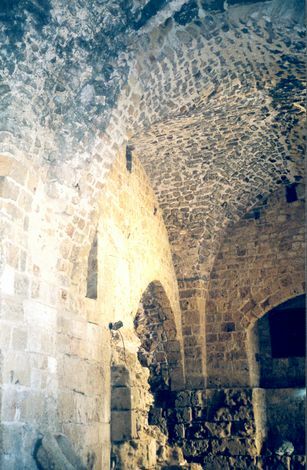 The so-called "dormitory," deep within the recently excavated fortress of the Knights Hospitallers: it may have been used for other purposes. Like the rest of the fortress, it was abandoned for centuries. 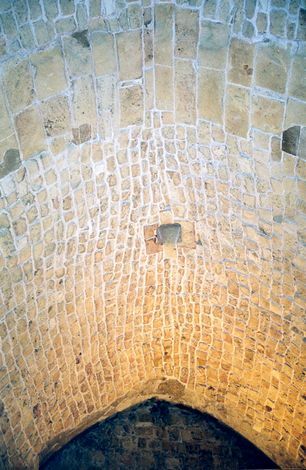 The Turks restored parts of the structure during the 18th and 19th centuries, but this deep room has only recently been excavated. 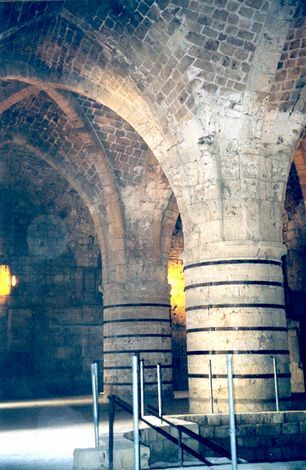 The Gothic vaulting of the adjoining refectory. A close-up of the fan vaulting, popular in France during the 12th century. 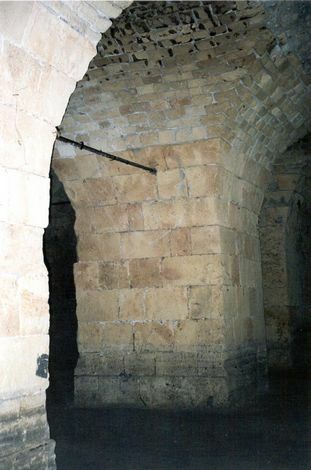 One of a row of halls in the fortress. The halls once provided segregated quarters for knights from France, England, Germany, Italy, and Spain. 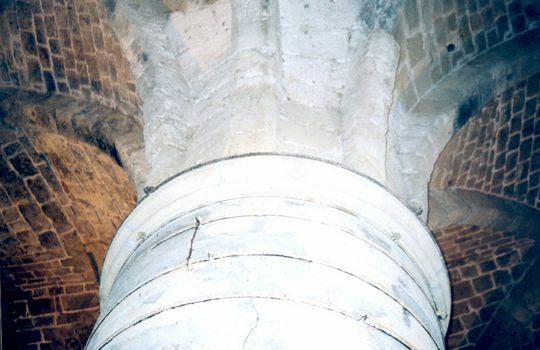 The vaulting is a none-too-refined Turkish reconstruction. The ceiling of the adjoining room. 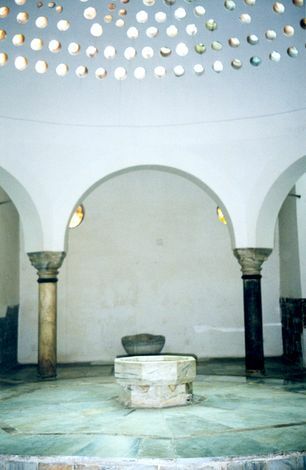 Near the fortress, el-Jazzar built this Turkish bath. 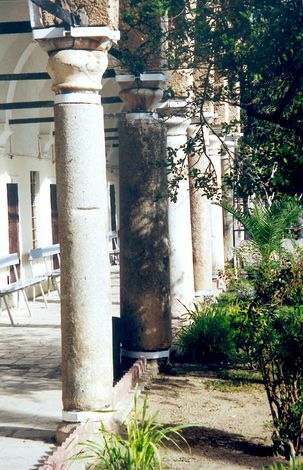 Near the old fortress, El-Jazzar built a mosque surrounded by a courtyard whose portico is lined with columns taken from Caesarea. A cruder side of the courtyard. 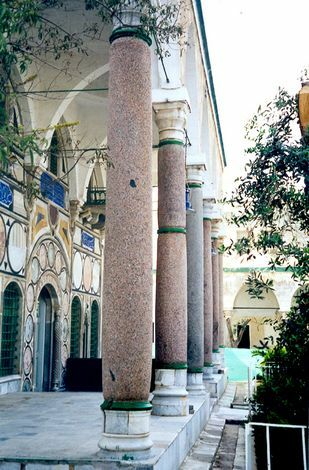 A clock tower was erected in 1906 at the entrance to the Khan el-Umdan, an inn that once served Genoese travelers. Genoa had helped in the city's capture in 1104, and the Genoese quarter was an important one. New buildings atop old foundations. 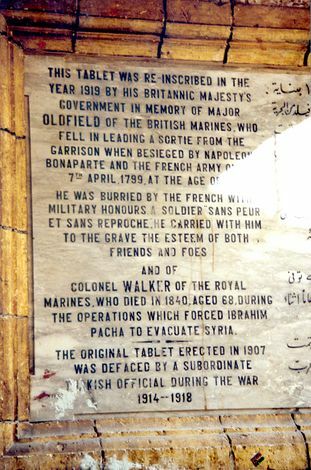 A momento of the city's struggle with Napoleon, when the British helped el-Jazzar successfully withstand the French siege. It's on a wall of the 17th century Orthodox Church of St. George.